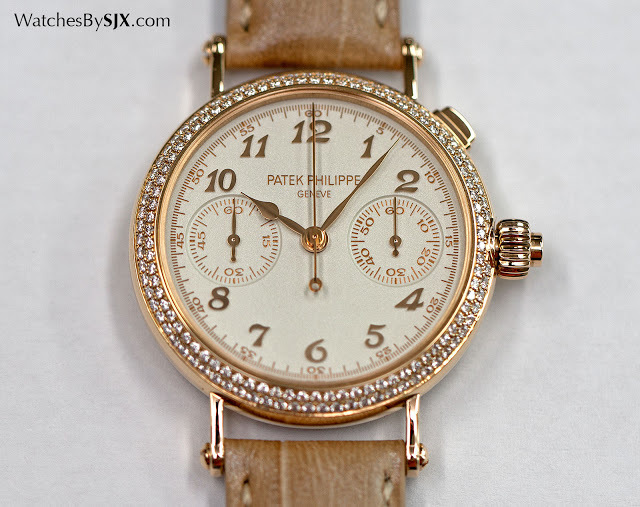 The Patek Philippe reference 7059 is an unusual creature, a delicately small ladies' wristwatch equipped with one of the most gorgeous and refined chronograph movements, the split-seconds calibre CHR 27-525 PS. We take a detailed look at the ref. 7059, complete with original photographs. As chronograph movements go, the Patek Philippe CHR 27-525 PS is one of the best, being exceptionally slim and compact, and a sight to behold. Most unusually, it’s found inside the ref. 7059R-001, a ladies’ wristwatch. While most ladies’ timepieces are either simple or equipped with complications regarded as feminine (like a moon phase), the ref. 7059 is resolutely complicated in a manner that will harm the heart of the most steely watch geek. The ref. 7059 is actually a repurposed men’s wristwatch, being originally the ref. 5959. Introduced in 2005, the ref. 5959 was modelled on a vintage chronograph from the 1920s. And it was sized like a vintage chronograph from the 1920s, with a case diameter of just 33 mm, making it impractically small by modern standards. Consequently the ref. 5959 sold poorly. At 33.2 mm wide the ladies’ ref. 7059 is slightly larger than its masculine counterpart, with the extra width to accommodate the diamonds on the bezel and back. The case is otherwise the same. While it was too small as a man’s watch, the ref. 7059 looks perfect on the female wrist. The ref. 7059 is similar in style to the men’s ref. 5959, with the same design elements but executed in a feminine manner. 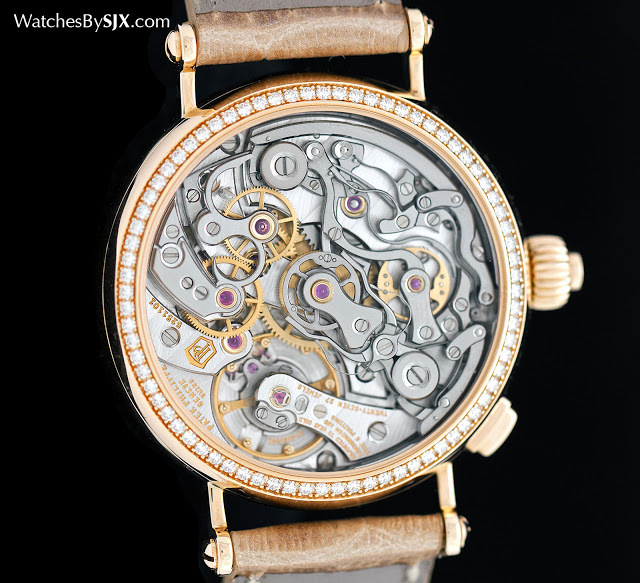 The rose gold case is matched with rose gold hands and applied numerals, while the dial has a grained, pearly finish. All the numerals and markings on the dial are printed with poudre lacquer. French for “powder”, the term refers to gold powder mixed into the lacquer, giving the markings a granular, slightly glittery appearance that is visible only up close. The ref. 7059 is a single-button, split-seconds chronograph, meaning it has one button to start, stop and reset the chronograph, which also has two central seconds hands, able to measure two simultaneous times of up to a minute each. 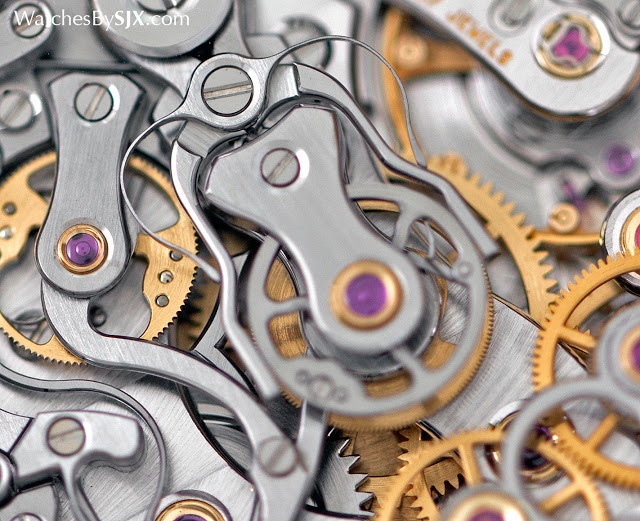 Despite the complexity of the movement, the face of the watch is clean and functional. The reverse, however, is wonderfully elaborate. At its launch the CHR 27-525 PS movement was the slimmest split-seconds chronograph movement on the market, standing just 5.25 mm high (it’s since been edged out by the Vacheron Constantin calibre 3500 by a mere 0.05 mm). But the movement inside the ref. 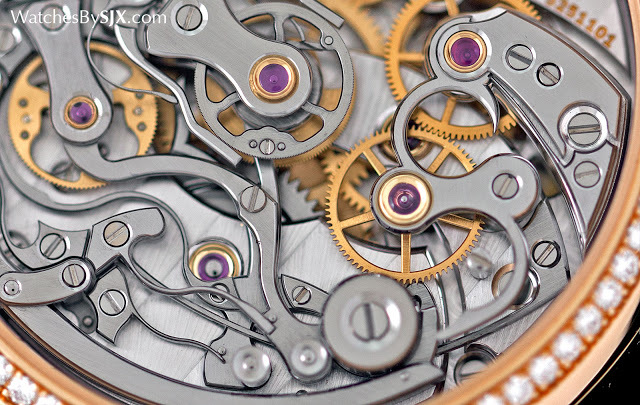 7059 is also notable because it was the first chronograph movement developed and manufactured by Patek Philippe itself. 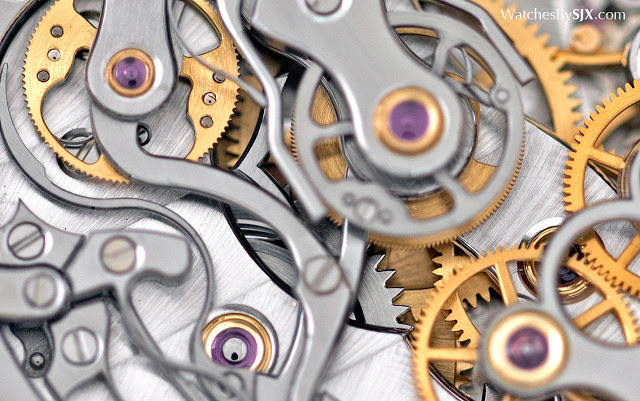 For all of its glorious, century long history of chronograph wristwatches, Patek Philippe relied on external suppliers for movement blanks, until 2005. Nevertheless the CHR 27-525 PS takes inspiration from a vintage chronograph movement used by Patek Philippe based on a blank made by Victorin Piguet, an esteemed maker of movements in the early 20th century. 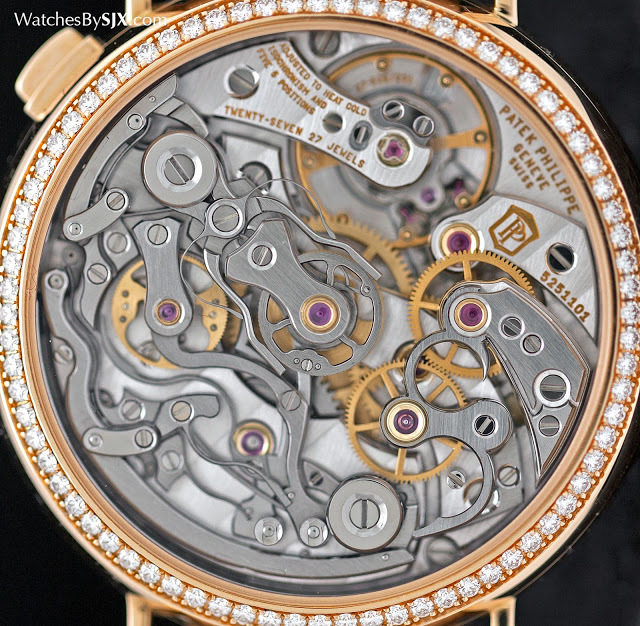 Consequently, the movement possesses the classical beauty of something constructed decades earlier. 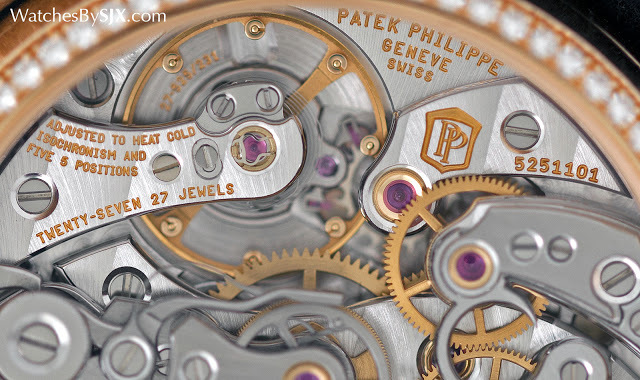 A good comparison is Patek Philippe’s other split-seconds chronograph movement, the CHR 29-535 PS found in the ref. 5370P. It is also gorgeous and wonderfully detailed, but evidently modern and lacking the elegant refinements of the classical calibre inside the ref. 7059. 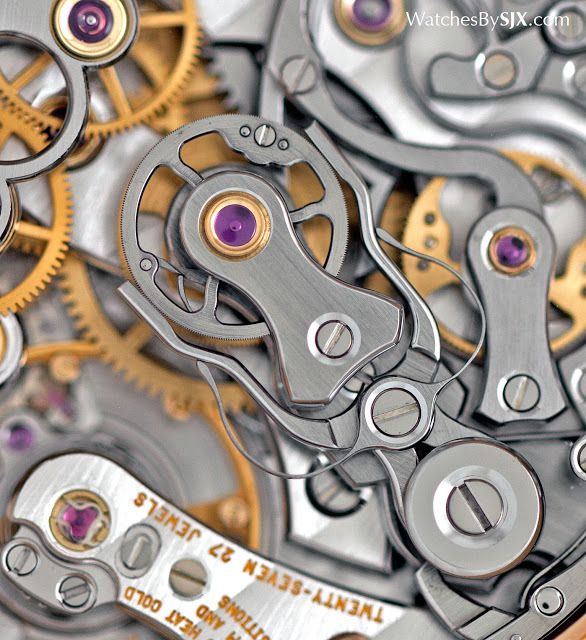 Despite being tiny, the movement enjoys the density and depth that characterises a chronograph movement constructed traditionally, and with aesthetics in mind. 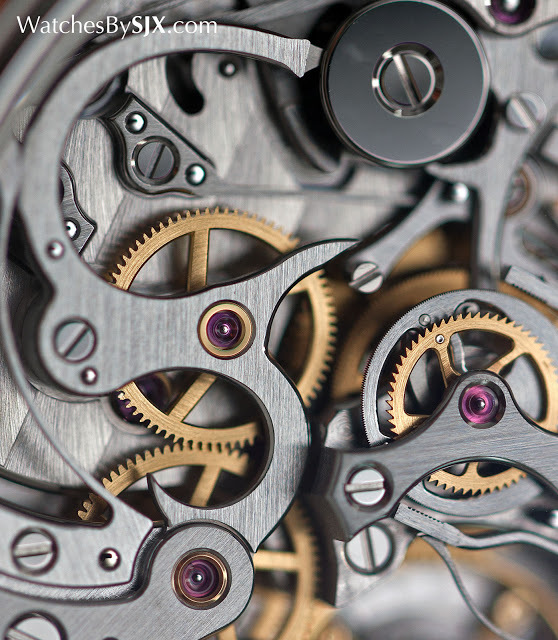 Like many high-end chronograph movements, the components of the movement are layered, with the dark grey steel parts of the chronograph mechanism sitting on the base movement, standing in contrast to the white rhodium-plate of the movement bridges below. 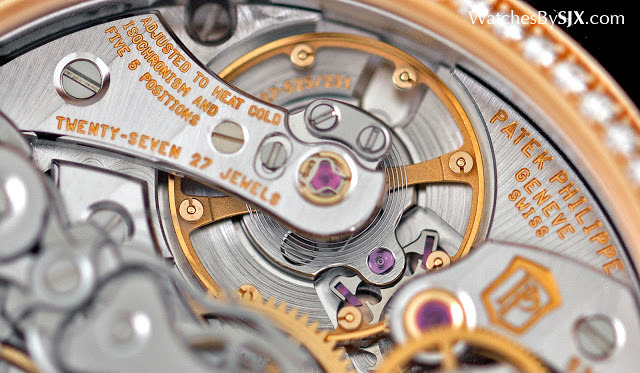 Right in the centre of the movement lies the split-seconds mechanism, with the distinctive pincers (which serve as the brake for the split-seconds) characteristic of this complication. It forms the highest point of the movement, with everything else cascading downwards from there. 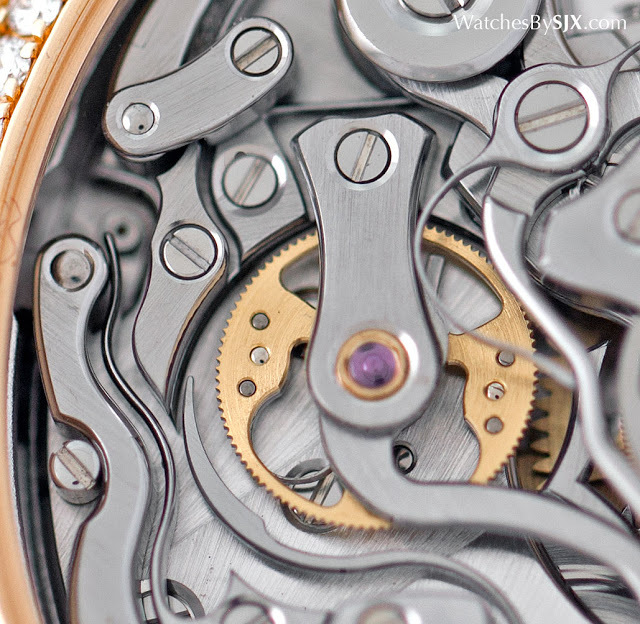 The CHR 27-525 PS is exquisitely finished, superior in its detailing to the more split-seconds chronograph movement. Up close, the expertise illustrated in its finishing is self-evident. 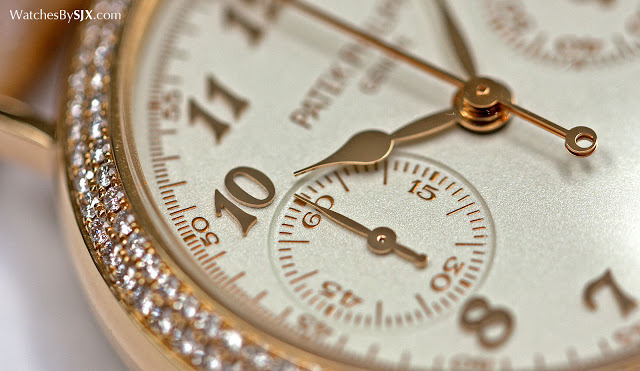 Even though all of Patek Philippe’s more ordinary watches usually have ordinary movement finishing, its top of the line complications still illustrate the brand’s institutional memory. The superiority of the CHF 27-525 PS is also evident in the construction of the movement, with the clutch lever for example. The S-shaped clutch lever is remarkably slim and sinuous in the CHR 27-525 PS (see below right). In the CHR 29-535 PS (shown below), the clutch lever is chunkier, with a slightly awkward outline. The movement is that much better, which means it is also that much more expensive. The price tag of the ref. 7059R, at about €350,000, is about 50 percent higher than that of the ref. 5370P equipped with the obviously contemporary CHR 29 movement.